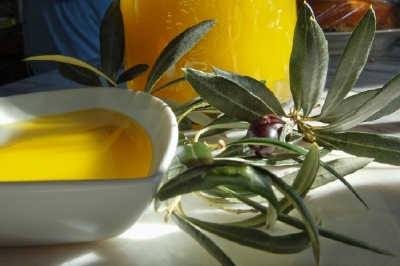 This oliveoil photo was taken in Sirince which is a small, beautiful town 9 km from Selçuk. Selçuk is the home town for Ephesus, if you've visited or have heard. It was one of the first days of 2007 and this was a virgin olive oil just pressed (cold) at an old, traditional (more or less) factory. You can imagine how great it was to have it for breakfast. What else was there for breakfast? The usual stuff. Black and green olives, cheeses (in Selçuk, you can get great local cheeses from local cheesemakers), dried tomato sauce with capers (this isn't the usual breakfast item! ), freshly baked -again- local bread and of course tea. What you do is to get a piece of bread, dip it in the golden olive oil and just eat it. That's it. The simple pleasure of life yet a unique experience!